From January 2019, Jurnal Sosial Ekonomi Pertanian (JSEP) has a new template and only receives articles using Reference Applications. The references should use a reference application management such as Mendeley or Zotero. So, please the authors can read and follow it. 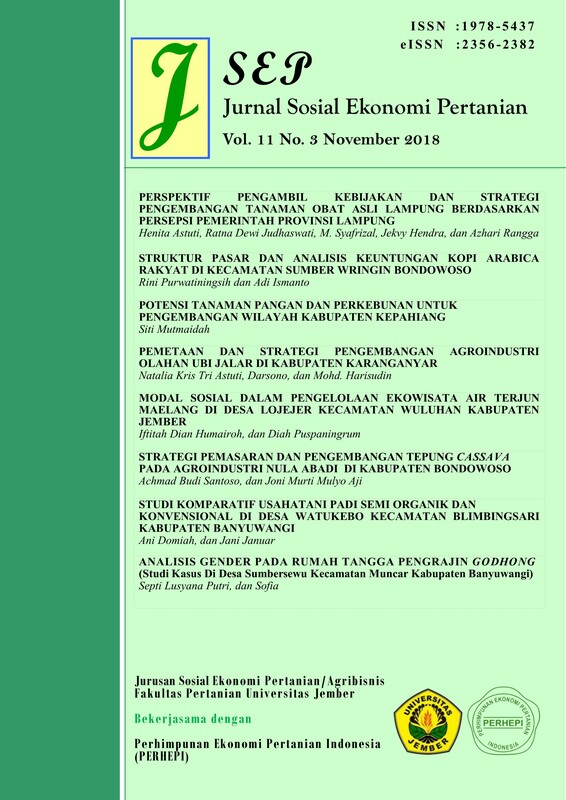 Jurnal Sosial Ekonomi Pertanian (J - SEP) is a scientific media which is managed by Social Economics Department of Agriculture Faculty of Jember University (Unej), contains an article about agricultural socioeconomic studies which is lifted from research result and critical study. JSEP is a media for disseminating information on the results of research and thought by lecturers, researchers, and practitioners interested in agricultural agribusiness and socio-economic progress. Jurnal Sosial Ekonomi Pertanian (J - SEP) is published three times a year (March, July, and November). Please submit your manuscript. Before submitting, please read the author guidelines.